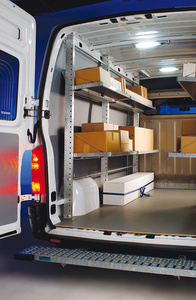 The express vehicle uses our Sowaflex wall cladding, the Sobogrip floor insert and the new express shelving system. Whether the delivery is parcels, washing machines, foodstuff, clothing or a mixed bag of deliveries, our shelving system will cope with it all efficiently. Quick to install and adjust it is the ideal equipment for general delivery, courier service, e-commerce home deliveries, catering companies and many more. Important: Express shelving should only be installed in a vehicle with a bulkhead separating the load from the driver and passenger seats.